I've finally joined the 'green juice' campaign. I've jumped on this trendy bandwagon because due to some health issues last winter I was unable to eat anywhere near the 'proper' amount of food. I picked up a Magic Bullet and have been happily juicing kale and spinach and adding either oranges or fresh pineapples (dear gawd - don't forget to add some sweet fruit!) to help me eat more each day. 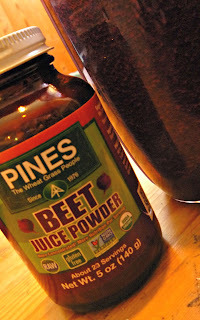 I received a free jar of Pines Beet Juice Powder and added two teaspoons to my kale and orange smoothie this morning. It does add some of that great 'earthiness' that's associated with my love of beets and makes the drink a deep red colour. It seems a bit pricey for a dried product but does contain mostly beets. This product is also raw, gluten free, non-gmo, and USDA Organic so overall it's a pretty slick way to get some beets into your morning smoothie. I wonder if it would make a good 'red velvet' cake? hmmmm.